My husband grew up on BEC, a.k.a. Bacon Egg and Cheese Sandwiches. They are a staple in New York and are sold at every corner deli. But much like corner delis, BEC are harder to find in other states. This has always confounded me, because they are SO good and I feel like every breakfast place should have them to go! There's nothing better in the morning than a warm, toasty, cheesy bacon egg and cheese sandwich. It has all the greatest food groups in one beautiful little breakfast package. These breakfast sandwiches are super easy to make and can be made into frozen breakfast sandwiches and then reheated when you are ready to eat them! They are a great on the go breakfast for when you are in a hurry. You can fry up the eggs or cook them in the wells of a muffin tin in the oven if you are making large batches. This is a super fast and efficient way to cook the eggs. It also makes them into perfectly round egg patties that fit really nicely onto an English muffin. If you want to make these super from scratch, try making homemade English muffins! Although totally unnecessary, they are super easy to make and are unbelievably tasty. However, it's not super realistic to make them all the time. They do freeze very well and can be defrosted and toasted in no time! You can also substitute a ciabatta roll, or hard roll for the English muffin. Toast the English muffin to desired toastiness. Heat a frying pan on medium heat, grease with cooking spray. Crack the two eggs into the pan and cook for 2 minutes. Flip and cook for another 30 seconds. You can cook for longer if you want the yolk less runny. Add the cheddar to the eggs and cover with a lid for about 30 seconds, or until the cheese melts. 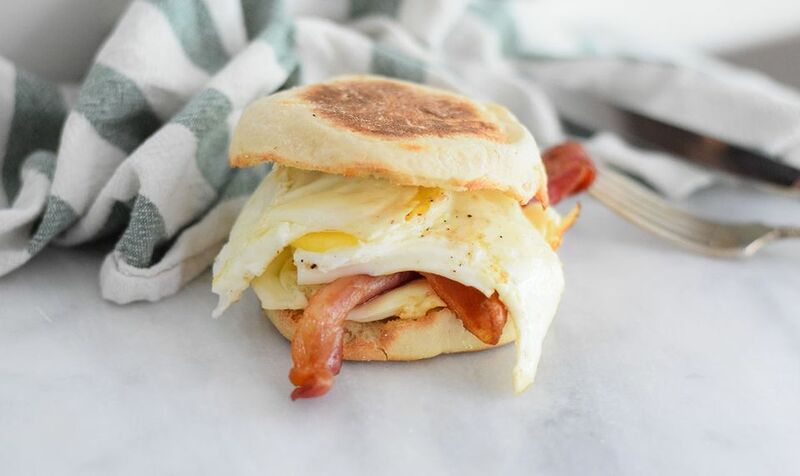 Place the eggs on the English muffin and top with the cooked bacon. Top with the other half of the muffin and serve! If you are freezing them, make extra and place them on a baking sheet. Allow them to cool for 20 minutes. Then wrap them individually in foil and freeze. Microwave or toast when you are ready to eat!